Like what I have mentioned in my blog earlier, it's never too late to prep your skin from aging. Due to our unhealthy lifestyle, environmental factors, hormonal factors, working stress and eating habit, our skin condition has slowly changed. Slowly by slowly, all the sign of aging has overwhelmed us. And when we realized later, it's always too late. Just to recap all the signs of aging, see if you have met one! So, obviously I have met three of them, not only having dry and sensitive skin, can you believe that I am having those fine lines on my forehead whenever I laugh too hard or stretching my brows? Well, I know I am actually one step closer to the signs of aging and I gonna stop it! FYI, the only way to get rid of all the signs of aging, is restoring the collagen in our skin cells. Collagen is indeed useful to our skin where it strengthen our skin cells and works like a filler that helps to boost the skin elasticity and even as a scar treatment. Since the collagen offers a wide variety of benefits, hence there come the inventions of collagen drinks, makeup and skincare products. Recently, I have been searching through all kind of collagen skincare on the site and one of my friend has introduced a pure collagen essence to me, which she found it quite effective and she can see the result after using it for a month. I have used it for a month. 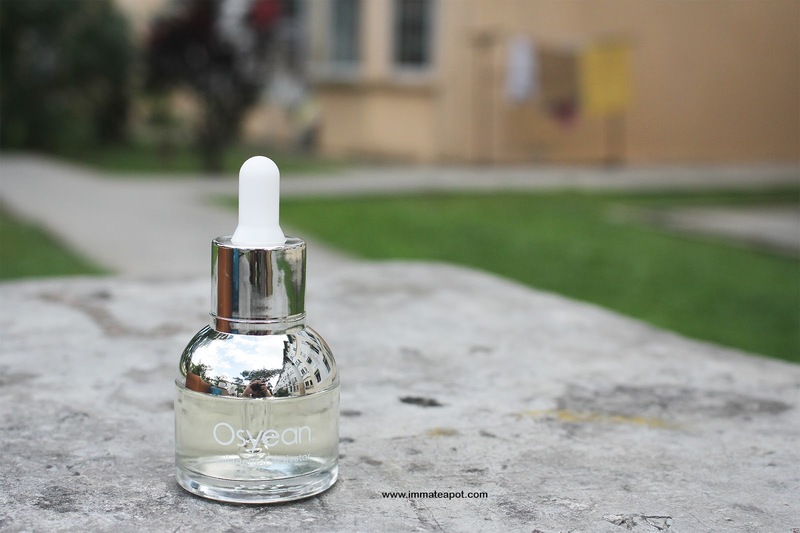 I think it definitely worth for me to share with all of you here - Osyean Oceanology Collagenoir Essence. 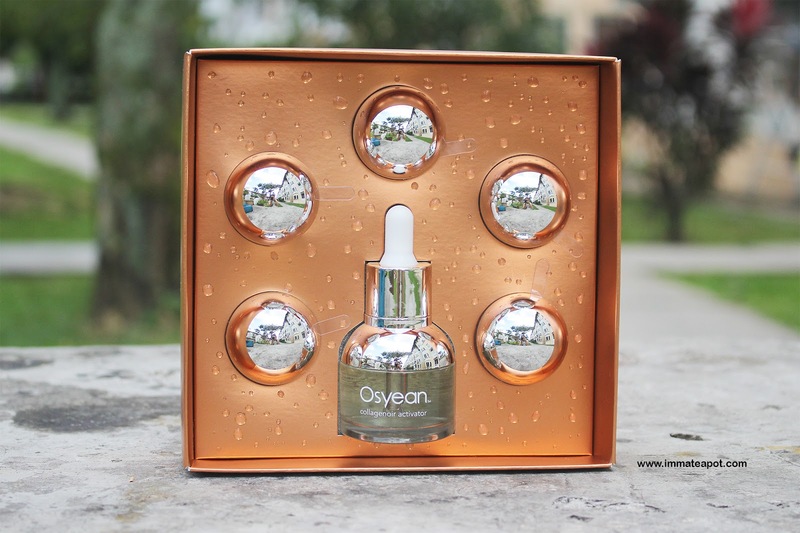 The name Osyean, is named after its 100% pure and unique extraction from Japan, that promise the consumers' with firm and youthful skin with the approval from the ministry of Health in Malaysia. Talk about the packaging, it is absolutely crazy and you get to know how quality and classy the products are just by looking at how much money they spend on the packaging itself. It comes in a thick square box with a reflective material cover. The cover is fully designed with the repetitive ocean waves, with thick and thin lines that lies in a horizontal way, that gives me a calm and relax feeling. For my first impression, it looks much like the smooth muscle cells that are layering. I love how they relate the marine collagen with the packaging. 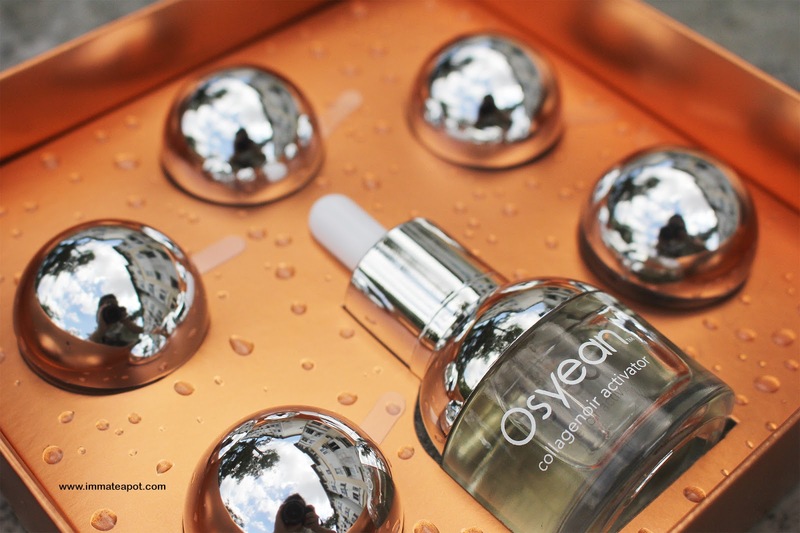 Within the box, it comes in a orangish-gold color, with 5 sphere shaped nectars and an activator in glass. Everything is set in place, without the need to worry if you may break any of them. Here's a closer look on the nectars with its reflective mirror kind cover and an activator that fills with solution. The Collagenoir Activator contains rich Vitamin C (Ascorbic acid), which works as an antioxidant agent that helps brighten the skin, reducing the appearance of dark spots, boost the production of collagen in order to delay the skin aging and promote skin healing. The activator come in a glass bottle with a bulb dropper pipette that helps controlling the amount of essence wanted. The essence is kinda concentrated, with a gel watery texture. It can be use as a serum or essence daily without the nectar. 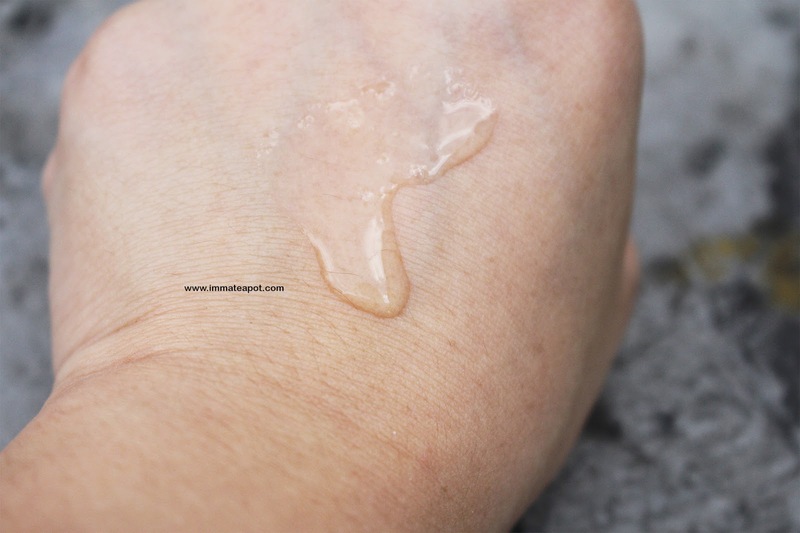 It penetrates swiftly into the skin layer and leaving the skin with a sticky yet glowy finish. 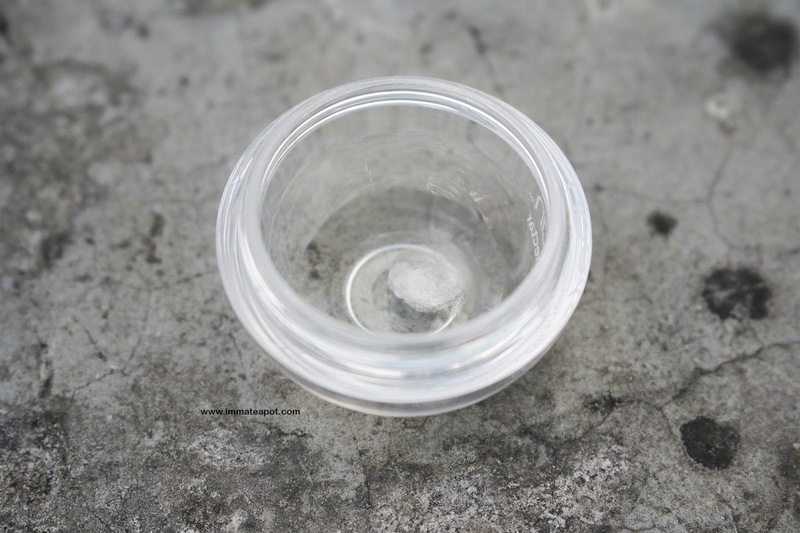 After the full absorption, there is no more stickiness but the skin appears to be soft and supple! The collagenoir nectar is sealed within a tiny bottle. One bottle for once usage weekly. Within the tiny bottle, there is a cotton silk ball? It is actually a collagen ball, with zero content of chemicals and allergens, that needed to be dissolved by the collagenoir activator. The amount of activator to be used is depend on what kind of texture of the essence that you prefer. If you want something dilute, not too gel-ly but with sort of watery gel texture, you may use about 4 to 5 drops of the activator. If you are going for something concentrated, much like the sticky kind of jelly texture, use about 2 to 3 drops of activator. 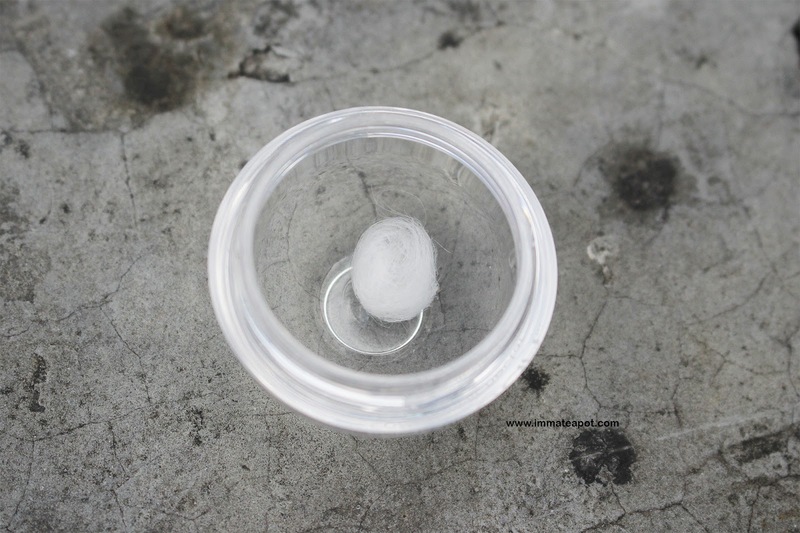 This is how the collagen ball looks like when it dissolves. 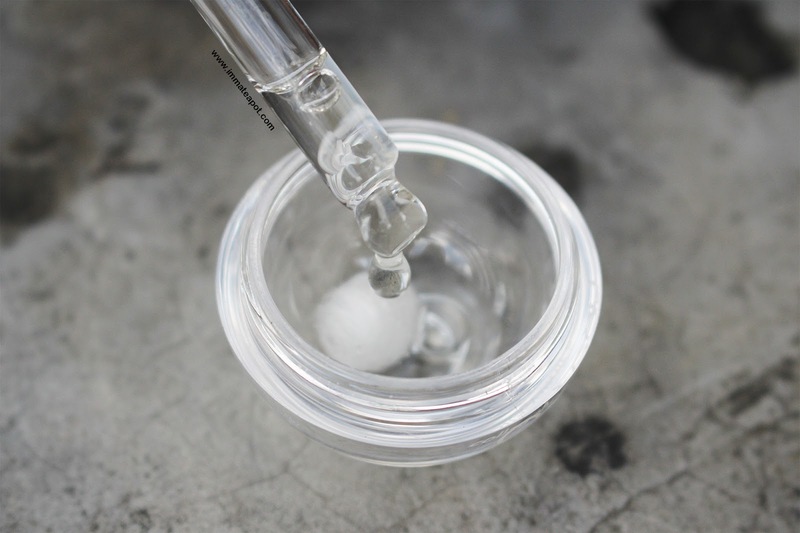 It takes some time to fully dissolve, about 3 to 5 minutes and within the time, I have to use something to keep on poking or immersing the collagen ball, as it may float on top. Hence, it takes a longer time to dissolve. Usually, I used about 4 to 5 drops of the activator and end up with about one-third of the essence in the tiny bottle. Guess it's more than enough to fully cover the whole face and neck. This is how it turns out when it is fully dissolve, in clear gel watery texture, with some sort of mild scent, but still bearable. The natural scent of the marine collagen? 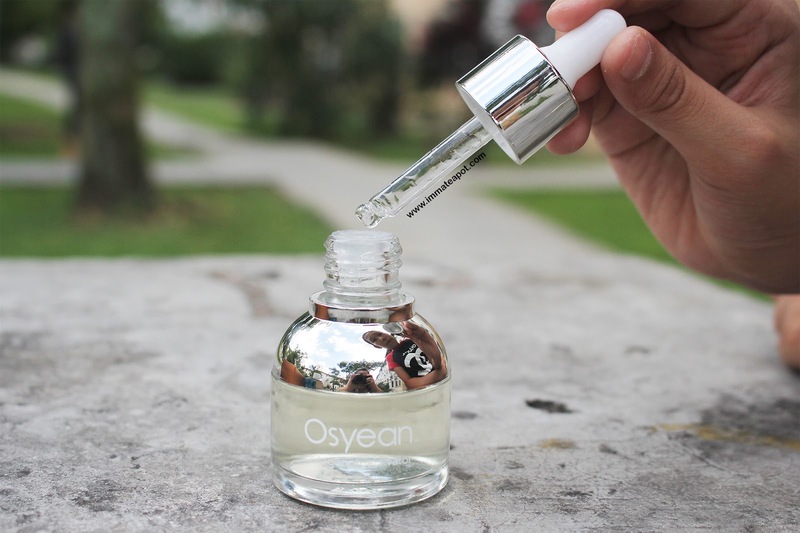 Do you know that with one single dose of Osyean, it is equivalent to 3 months of regular collagen serum? Yup! It is also 1.5 times more absorbent than other collagen sources. Guess nothing stronger that 100% pure collagen that generates 100% pure result? Here's the result on the second week, with a significant contrast, my skin is way glowy and fairer after the application. Beside that, the redness on my skin has reduced. After the application, I feel the soothing and cooling effect on my skin. It is quite sticky on the face, yet still bearable to me. What matters when you can really see the significant result?! As I said, you can control on the texture by yourself! 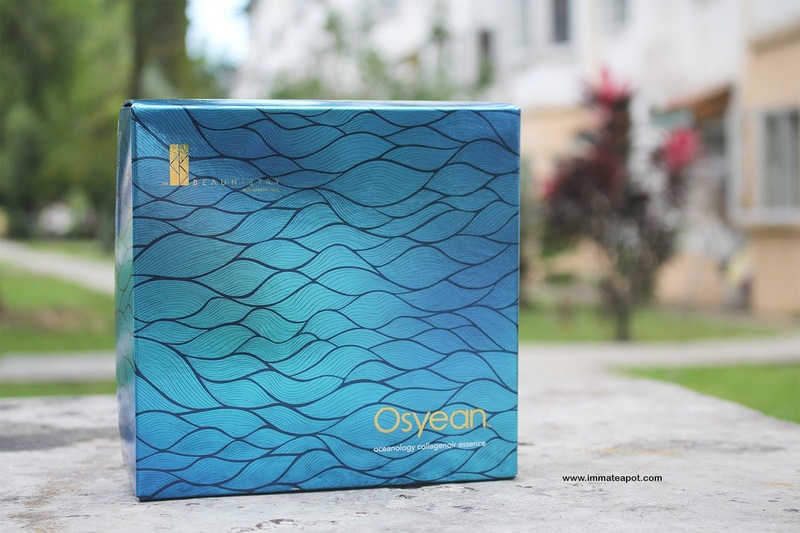 A box of Osyean come with 5 dose of collagen nectars, which is 1 dose per week. So, I have picked up this challenge which took me about one month and one week. Here's the result after 5 dosage used. 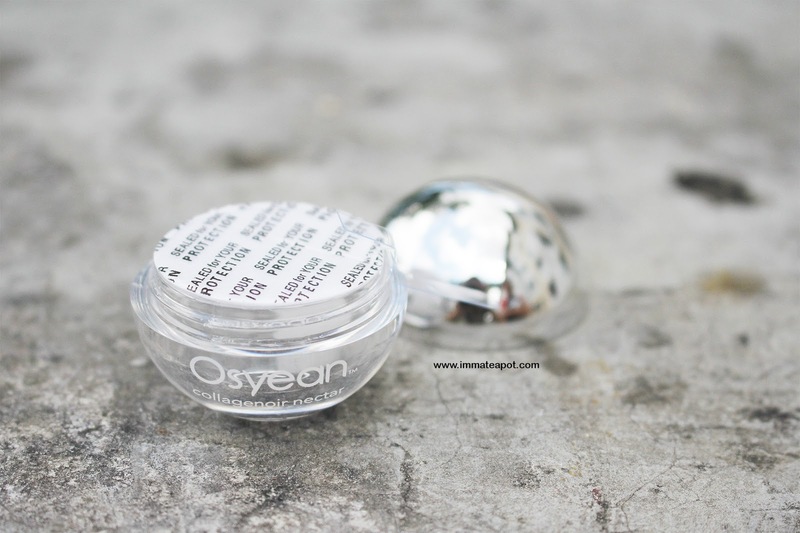 Before using Osyean, my skin was dull and the skin tone was obviously uneven. After 3rd dosage, my skin has become much glowy and firmer, a pointy V-shaped chin! Yet, the pores and redness never reduce, maybe because I was still adapting to the weather in Malaysia after came back from Taiwan. After 5th dosage, guess all of you can really see the difference as my skin complexion was so much brighter and the pores have reduced. So happy that my face wasn't that dull in tone again, it was smooth, even and healthy! My face appeared to be firmer and tighter, with suppleness! Since CNY is edging close, Osyean is having a promotion of purchasing a set while getting 50% off on the second set! i want this too. mine finished edi. Babe love your natural look.you so pretty. Hope I will get to try it one day . Your skin looks like it really glows after a few applications. Sounds like a good product to start using. I love all collagen's products! Checking it out! The packaging looks really sleek. Your skin is glowing after the fifth dose! it does looks really effective on your skin! I can see the improvement from your skin. it look like a great product! is it suitable for 26 year old girl? Can see a huge difference after your 5th dose. My skin is gone after my trip to India. I can do with some help. Look effective, I'm interested to try, but abit costly la.. The packaging is unique and it come with this 5 balls. Can see your face look more radiant. 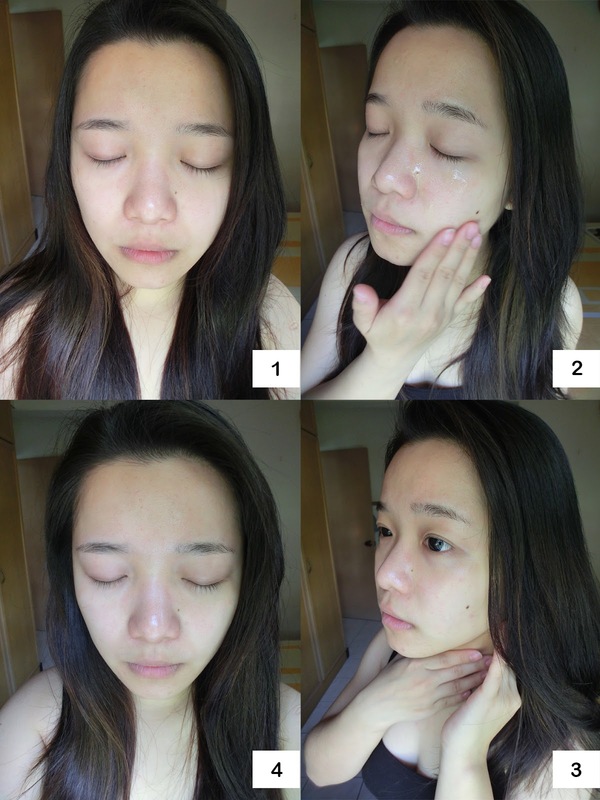 the result is great and noticeable, your skin looks glowing, I love transparent formula too, where this brand comes from? I cant wait to start trying mine, the results looks promising. I don't think it's recommended to do anything anti- aging if you are below 30 years old, right?